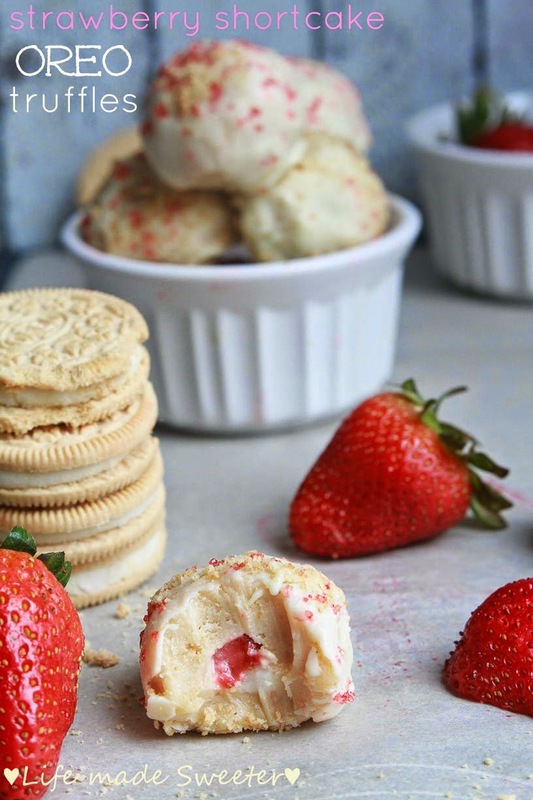 Strawberry Shortcake Cheesecake Parfaits make the perfect easy dessert. Best of all, lightened up with low-fat Greek yogurt and low-fat cream cheese. 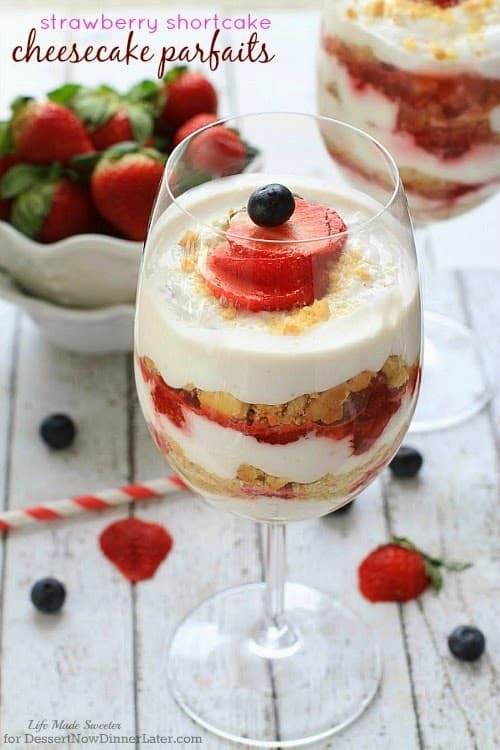 A simple cheesecake parfait with delicious layers of shortbread cookies and sweetened strawberries. Here’s a super easy treat when you’re craving something sweet and fruity. 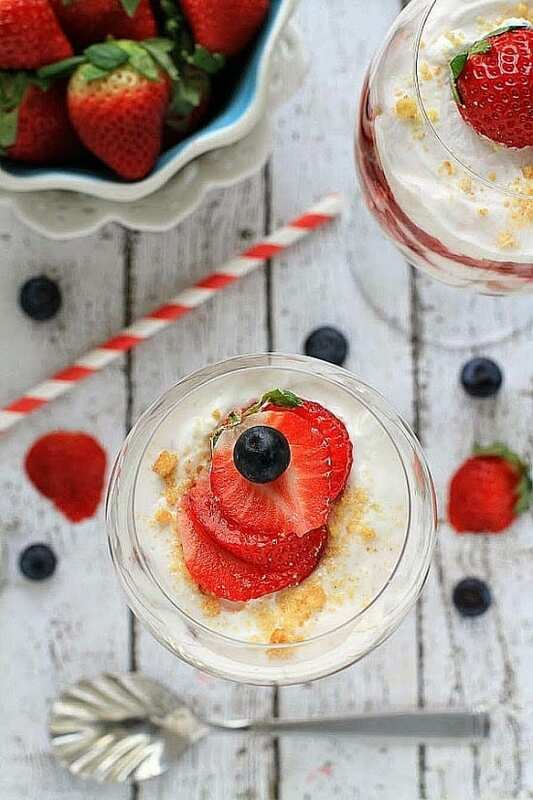 These Strawberry Shortcake Cheesecake Parfaits are not only super simple, you can easily swap out the ingredients for anything you like or have on hand. Since they are no-bake, you won’t have to worry about heating up your oven on those hot summer days. They would make a great spring dessert for Mother’s Day or baby show celebrations as well! First layer —-> Start off by layering some crushed shortcake/shortbread cookies. You can use crushed Graham crackers or even golden Oreos if that’s what you have instead. Second layer –> Add layer of the lightened up cheesecake layer. 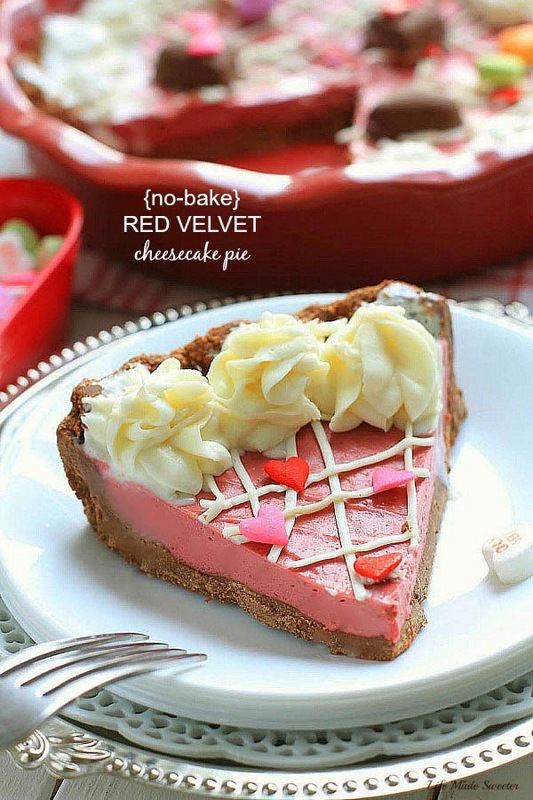 It’s made with vanilla extract, confectioners sugar, non-fat Greek yogurt and low-fat cream cheese. If you don’t have non-fat Greek yogurt or low fat cream cheese, just use regular if you’d like or you can even substitute the Greek yogurt with whipped cream or a frozen whipped topping like Cool Whip. Third layer —–> Mix some sliced strawberries and sugar together and add a spoonful over the cheesecake layer. You can also substitute other berries or any other fruit in here if you prefer. Then you just repeat the layers again until you’ve filled your serving glasses. Top with some fresh slices of fruit and you’ve got an elegant dessert that’s sure to win over any hearts! A simple and lighter cheesecake parfait made with low-fat Greek yogurt and low-fat cream cheese along with delicious layers of shortbread cookies and sweetened strawberries. For the Strawberries: Combine the berries and sugar in a bowl and place in the fridge to chill while you prepare the cheesecake portion. For the Cheesecake Layer: In a medium sized bowl beat the softened cream cheese for about a minute until smooth and creamy. You can either use a handheld mixer or even a fork or whisk. Mix in half of the Greek yogurt until smooth then add the remaining half, along with the vanilla extract and heavy cream. Continue to mix until smooth. Slowly add the powdered sugar until everything is well combined. 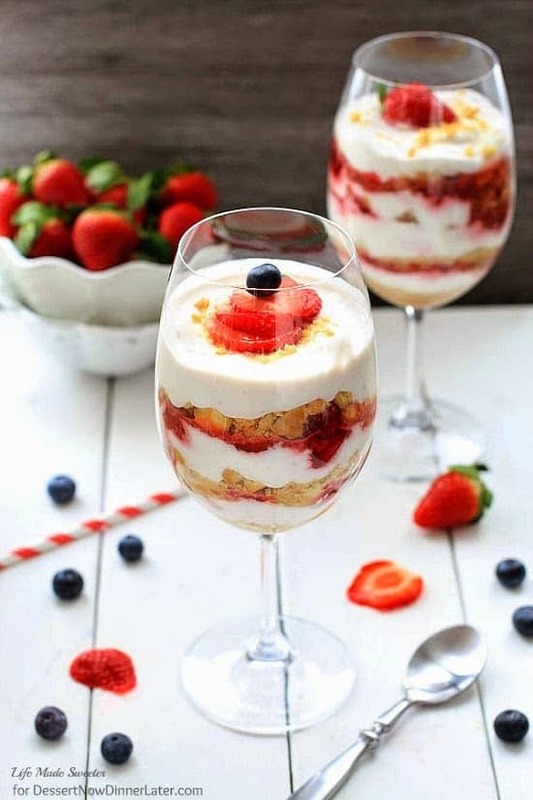 To Assemble: Assemble the parfaits by layering the crumb layer, cheesecake mixture, and strawberries in alternating layers evenly. Top with fresh sliced strawberries and blueberries if desired. Place in the fridge and chill for about an hour. Serve with spoons.